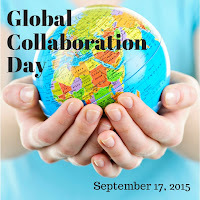 Steve Hargadon: All Invited to Global Collaboration Day - September 17th! The primary goal of this whole day event is to demonstrate the power of global connectivity in classrooms, schools, universities, and institutions of informal learning and around the world. Global Collaboration Day will introduce others to the tools, resources, projects and programs that are available to educators today. We currently have over 130 schools and organizations representing about 29 different countries; 25 outreach partners have also committed to joining this worldwide event. Approximately 52 events are listed on our site and this list is growing by the day. There is no cost to participate at any level. Examples of events that are currently scheduled include a Twitter chat on global learning, an asynchronous Twitter poll on chocolate, a survey on sunlight around the world, and a class live streaming using Periscope. Many organizations are hosting webinars and other activities to introduce educators to tools, resources and programs that will help them connect their classroom to the world. We recommend that activities be simple in scope and have low barriers to entry in order to attract participants. Ideas are listed on our host page. Events can be geared towards any audience including students, teachers, parents, and organization leaders. For further information, please take a look at our website and press release. Also, check out this recent article on us from eSchool News and Lucy's Edutopia blog post. Thanks and we hope to hear from you regarding this special day!